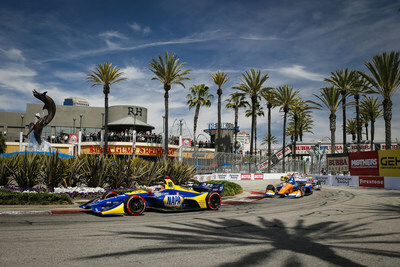 LONG BEACH, California, April 15, 2019 /PRNewswire-HISPANIC PR WIRE/ — Starting from the pole, Alexander Rossi fended off an early challenge from fellow Honda driver Scott Dixon and then took command of Sunday’s Acura Grand Prix of Long Beach, dominating the 85-lap race and moving into second in the Drivers’ Championship points standings after four of 17 races. Rossi led all but five laps of today’s 85-lap contest to score his second consecutive NTT IndyCar Series victory at Long Beach, becoming the first driver to successfully record back-to-back victories on the classic temporary street circuit since Alex Zanardi accomplished the feat in his Chip Ganassi Racing Honda in 1997-98. Today’s victory was the third for Honda in four races this season, and the 14th Honda win in 20 races at Long Beach. Dixon continued in second place until the first round of pit stops, where he briefly dropped to fourth behind Josef Newgarden and Will Power, then moved to third when Power briefly slid off course on Lap 31. But an issue with the refueling probe during his final stop cost Dixon 18 seconds in pit lane, dropping him to fifth, behind both Graham Rahal and Ryan Hunter-Reay. Dixon passed Hunter-Reay, who was having to save fuel in the closing laps after making an early final pit stop, for fourth place on Lap 81 and quickly closed on Rahal, who was slowing in the final laps due to tire wear. On the final lap, the pair made contact when Dixon attempted to pass while exiting Turn 8. Following the checkers, Rahal was issued a time penalty that reversed their finishing positions, awarding Dixon with third place and dropping Rahal to fourth. Behind the leaders, Hunter-Reay conserved fuel to finish in fifth, with Takuma Sato, winner of last weekend’s Honda Indy Grand Prix of Alabama, eighth. James Hinchcliffe, moving up from 15th on the starting grid, and rookie Felix Rosenqvist rounded out the top ten for Honda. The NTT IndyCar Series now heads “home” to the Indianapolis Motor Speedway for “Month of May” activities, including the May 11 Grand Prix of Indianapolis road course race and the May 26 103rd running of the Indianapolis 500. Both races will be broadcast live on NBC. Social media content and video links from this weekend’s Honda IndyCar Series action at the Acura Grand Prix of Long Beach are available on Facebook (https://www.facebook.com/HondaRacingHPD) and Twitter (https://twitter.com/HondaRacing_HPD) channels. Produced by the Carolinas Production Group, YouTube video packages can be found at: https://www.youtube.com/HondaRacingHPDTV. Long Beach Convention Center (1.968-mile temporary street circuit) Long Beach, Calif.